The first priority in Syria is to stop the violence and the global powers such as Russia and America need to hold a peace conference to do this, says the Vatican's representative at the United Nations in Geneva. "The powers that call the shots and make the real decisions regarding the war in Syria must come around and sit at the same table," said Archbishop Silvano M. Tomasi, the Holy See's representative to the United Nations in Geneva. "There is a priority to again have a conference for peace and establish the premises to agree and stop the violence and then slowly other political solutions will come about," he said Sept. 17. Tomasi was speaking during a side event during the September session of the U.N. Human Rights Council entitled "Where is the political will to stop the wars in Syria and in Iraq?" The Geneva event was held in conjunction with the Holy See's mission at the U.N., Caritas Internationalis, Dominicans for Justice and Peace, the World Evangelical Alliance and the Pope John XXIII Association. "As the wars in Iraq and Syria rage, the Human Rights Council continues to denounce all of them and all of those who are protagonists in fuelling them," said Tomasi. Despite this, he said, the wars continue to escalate "with little sign of any political will to end them." "In some ways, this is a proxy war to decide on which power will exercise the most influence in the region," said the archbishop. The first circle of the conflict is that between the Syrian government and its opponents. The second cycle is that of Sunni countries and communities versus Shia ones. 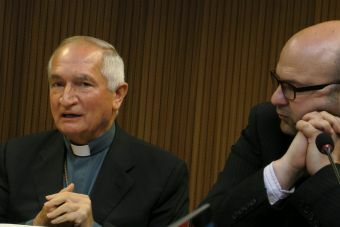 (Photo: © Peter Kenny / Ecumenical News)Archbishop Silvano M. Tomasi (L), the Holy See's representative to the United Nations in Geneva and Andrew Feinstein, executive director of Corruption Watch looks on at a conference on "Where is the political will to stop the wars in Syria and in Iraq?" in Geneva on Sept. 17, 2015. "The third cycle implicates the great powers of the United States and the Russian Federation. "The complexity of interests challenges any attempt to dialogue and arrive at a cease-fire and putting an end to the violence." After Tomasi's plea, U.S. Secretary of State John Kerry said Sept. 18 that the United States was prepared to engage in military-to-military talks with Russia concerning Syria, The New York Times reported. "The president believes that a military-to-military conversation is an important next step," Kerry said, "and I think, hopefully, it will take place very shortly." Dominican Father Mike Deeb said, "At the heart of this discussion lies the decision of several State and non-State actors to arm one or other of the protagonists in the war. "Divergent political interests are used to justify such military support regardless of the severe consequences they provoke for respect for human rights." Elucidating on this at the same Geneva conference was Andrew Feinstein, executive director of Corruption Watch and author of "The shadow world: Inside the global arms trade." "When considering the ongoing conflicts in Iraq and Syria, it is important to consider, in addition to the geopolitical and ideological dynamics, the nature and functioning of the global arms trade, that feeds these conflicts, intensifies the massive abuses of human rights, and which undermines the prospects for peace," Feinstein notedfou. He has personal knowledge of the repercussions of arms dealing, noting he has done this for 15 years since he began investigating and researching the trade. That was when he was a legislator for South Africa's ruling African National Congress investigating a US$10 billion arms trade involving $300 million of bribes. He resigned as a member of South Africa's parliament in 2001 when the ANC refused to launch an investigation into the matter. Feinstein said that corruption goes hand in hand with international arms dealing with kickbacks and bribes commonplace worldwide. "Global military expenditure is estimated to have totaled $1.75 trillion in 2015, that is $250 for every person on the planet," he said. The small arms trade is worth at least $8.5 billion and around five million firearms are sold in a year, while every year about 526,000 violent deaths occur through warfare and murder. "The United States buys and sells almost as many weapons as the rest of the world combined. "Other major producers of weaponry include Germany, the UK, France, Russia, Israel and China. These countries sell weapons through their large, government subsidised defense companies," explained Feinstein. He cited a study by Joe Roeber, who was then at Transparency International, who calculated that the trade in weapons accounts for almost 40 per cent of all corruption in all global trade. "Roeber argues that the arms trade is hard-wired for corruption. It is built into its structure, its very DNA. "You have contracts worth a vast amount, being decided on by a very small number of people behind a national security imposed veil of secrecy - perfect conditions for rampant corruption and other illegality." Feinstein found a profound irony in that the current "tidal wave of refugees are going predominantly to the countries that are the biggest suppliers of weapons to the conflicts they are fleeing."